This rug is exactly like the photo. It is the same color as our 9 x 12 sea grass rug. It is a rough texture on the feet but that is the characteristic of this natural material. Turn any living space into a stylish beach home with the organic beauty of this 2'6 x 6' seagrass rug from Safavieh's Natural Fiber Collection. Bordered in beige cotton twill, this rug's clean, neutral pigments and elegant basketweave design allow for unlimited decorating versatility. Love the look but painful! Ah, I want to love this runner...has a great natural, textured look but it hurts so much to walk on it! I had it in my entry way and my (adult) son said he felt he had to put shoes on to walk across it. I moved it to somewhere else in my condo but honestly don't know how long I will keep it. Too late to send back. For those with tougher feet, this may work! I purchased this rug because it was neutral in color and has natural fibers. I live in a log home so it is perfect. I love the look of this runner. Also purchased a matching 5x8 for under dining table. No odor, no dirt or dust from the fibers—just perfect look and very easy to vacuum. My 65 lb. German Shepherd puppy who chews everything in sight has NOT attempted to chew those rugs—yippee! I’ve had the rugs for 6 months and pup is still not interested so I think they are safe LOL. I purchased the natural fiber sea grass rugs to go with my summer beachy decor but discovered that when I switched to my winter country style of black and white buffalo plaid curtains and pops of burgundy and mustard that the rugs looked great so I can use them year round. Very happy with purchase and of course Overstock delivers quickly and securely with excellent customer service. Very happy! Great Look for entry way. I highly recommend these rugs for any entry way or foyer. They protect the floor while adding a nice touch at very affordable price. I am buying more! Good for price. In humidity, they have pleasant order. Cotton binding stains easily but looks okay on this natural mat. Comparible with dog, he lays on it. Vacuums easily. This rug runner is thin enough to not drag when the door is opened and I am pleased with how it looks in the entryway. I have a heater vent right in front of the door and needed a rug to cover it’s difficult location. It had a few loose ends in the weave but it was not a problem to cut them flush with the rug. The neutral color blends well with the other natural colors in the room. Very satisfied with this purchase and would recommend. Runner is as pictured! Nice color, texture and appears after using for a week to be exactly as described. Hopefully, we will get several years of good wear in our laundry room from this rug. very sharp sharp natural fiber on bare foot. nice size and pleasing to the eye. they were both a disappointment. I have this runner in my long entry way. It has held up nicely under heavy traffic. Looks great. Color is more green and less warm. Had it for two weeks, fibers are starting to poke out. I love this rug, it is on the tile leading inside from our garage! It always looks clean even after all the ice, salt and snow we’ve had over this winter in Nebraska! It’s a great choice! Bbvery good rug. It holds up better than one would expect and has a good ability to hold its position on the floor..so it is safe for a busy entryway. I was pleasantly surprised. Also,it cleans up easily. Not, however good on bare feet. Very attractive rug and made well, but uncomfortable to walk on. This Seagrass rug is awesome. It is impeccable in quality. The underside of the rug is finished so nicely! I would recommend Overstock to anyone. They carry the best quality items at excellent prices. Nice runner for a foyer. I like that it has a backing. And it's very sturdy and well made. I may purchase another larger one, as well. Great buy. Feels great on bare feet. Soften my entryway. A perfect year round rub. Many compliments. The color variation is neutral enough to pick up surrounding colors and balances. "I want to use this rug in an entryway. I read a review that dirt seeps through. I'm concerned with wet shoes from rain/snow that the water will seep through and damage our new hardwood floors. Will this be a problem?" 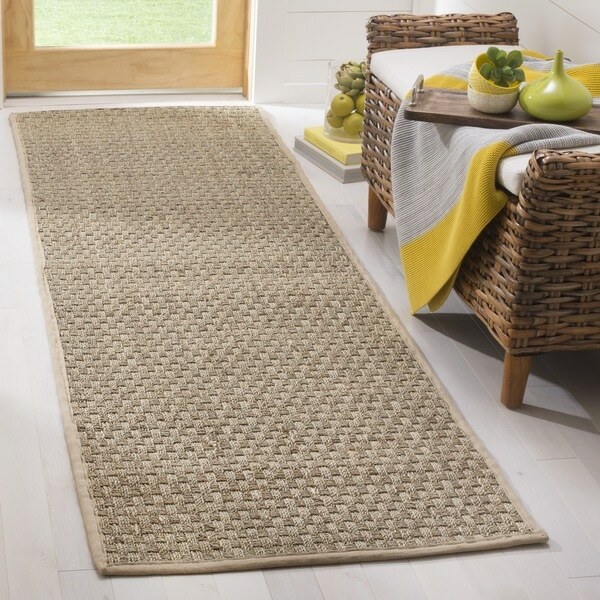 Hello waj580, the sisal material is very durable and dirt can be brushed off and vacuumed. Thanks for shopping with us! "can you dye this rug?" Hello 1992girl, yes but any modifications to the product may void your warranty. Thank you for shopping with Overstock! Matches my dining room rug. Hello pbandj, I recommend spot clean only, no harsh chemicals. Thank you for shopping with us! Is this rug sisal on both sides? What is the backing on this rug? Is it sisal on both sides?